A day at the spa isn't just for women anymore -- turns out men like to relax in much the same way. At The Boardroom in Southlake, male grooming finds its groove. “We want the client to come in and feel like the place is ‘Cheers’. He comes in and everyone knows his name. He feels very comfortable.” says owner Bruce Schultz. “We are very focused on giving outstanding client service and we do a lot of repetitions of that,” adds Schultz. One customer says staff run the place like clockwork. The Boardroom offers relaxed grooming experience -- for the guys. The salon’s signature package is called “The Benchmark”. If you ask Handley, it’s a standard you’ll want to splurge on. It starts with a haircut and something to tame your thirst. “They can offer you free drinks, so you can have a water or a beer. It’s nice. I usually figure it’s 5:00 somewhere,” explains Handley. After the haircut clients can then go for a head, arm and hand massage. “If you’ve never had someone give you a scalp massage, you’re in for a treat. It’s wonderful,” says Handley. Not only does The Boardroom offer a variety of services, it also offers two ways to pay -- by package or by membership. “If a client is coming in once every three weeks, he’s getting a 23% discount on his hair cut and we want the client to come in and feel like this is his place where he can walk in, get a haircut, you know he’s going to know the team,” explains Schultz. “I feel like I pay for the scalp massage and get the haircut for free. This is wonderful. You usually want to take a minute and kind of collect your bearings after the scalp massage and the facial massage too,” says Handley. The facial massage includes grape seed and eucalyptus oil. After, you’ll go back in the styling chair to freshen up before you go. “Very relaxed. I think that’s what differentiates The Boardroom from other places. You know it’s much more than just coming in and getting a haircut,” says Handley. 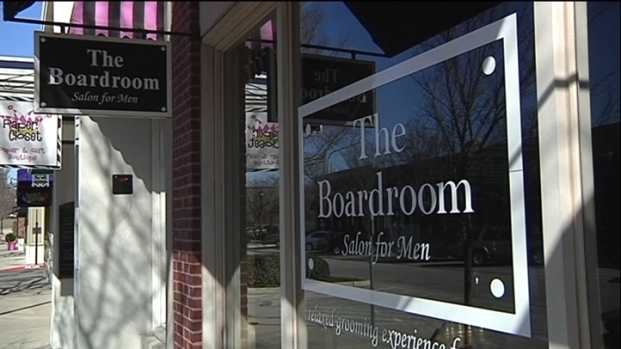 We visited The Boardroom location in Southlake for this story. Other locations include Dallas, Plano, Allen and Highland Village.